Windows 10 lets you scan your hard drive(s) for errors while you use your computer – and it’s easy to do. Open File Explorer (Windows Key + E) . 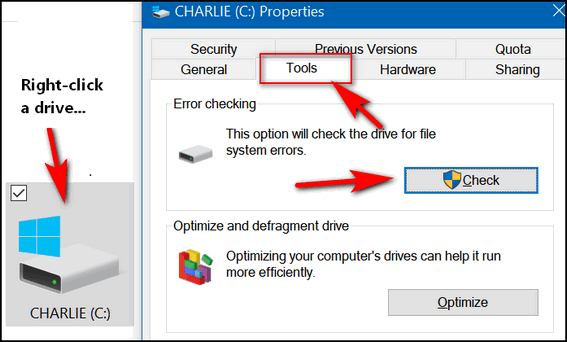 Right-click on your C:\ drive, click “Properties”. When the “Properties” dialog opens, click the “Tools” tab and then click the “Check” button. Once you click the “Check” button, you’ll see the following dialog appear. If you need to scan the for errors it will tell you. If you don’t (as below) it will tell you that also. Even if it says “You don’t need to can this drive”, you can still scan the drive if you want to. Just click “Scan drive”. Will this work on a SSD running win 10 ?. You can run it but but it’s not recommended. The increased disk activity of running CHKDSK (scans) on SSDs can shorten the life of the drive. Those with HDDs need to run it to find and fix bad sectors. HDDs have a “controller” which does something called “Bad block management” Bad block management keeps a record of broken cells and replaces them with healthy cells that have not reached their maximum (program-erase) P/E cycles. It’s complex… you can google flash P/E cycles and bad-block management if you want to learn more. I’m certainly not a SSD expert. I would recommend you don’t run the scan on SSD. It’s not that it will ruin the drive like running defrag can, but it can shorten the life and you can’t fix bad blocks with it like you can bad sectors on a HDD.